The earliest floor type was quite simply the ground itself – homes and buildings were built up on levelled surfaces and the stone or earth became the flooring surface. Just as resin acts as a ‘skin’ that softens and mimics the subfloor it lies on, so did the ancient tradition of laying hay, straw, cured animal skins and even compressed waste on the original ground. One of the more hygienic and pleasant options was the custom of pouring sand over the ground as a floor covering – when this became dirty, sodden or unsanitary it would be swept clean and a fresh coat applied. At Sphere8 we think we can liken this to our popular sand and reseal option – sanding down the original poured resin floor and applying a new top coat to refresh a tired or scratched surface. Possibly a bit of a stretch given a sand and reseal is only necessary in some cases, and even then, after 10 or 20 years! There are other parallels between a poured Sphere8 floor and this ancient tradition of sand floors – the concept of design. In India, these sand floors were developed using an array of different coloured sands (tinted in a variety of ways), and traditional dirt floors developed beautiful patterns – arguably the first form of floor graphics! 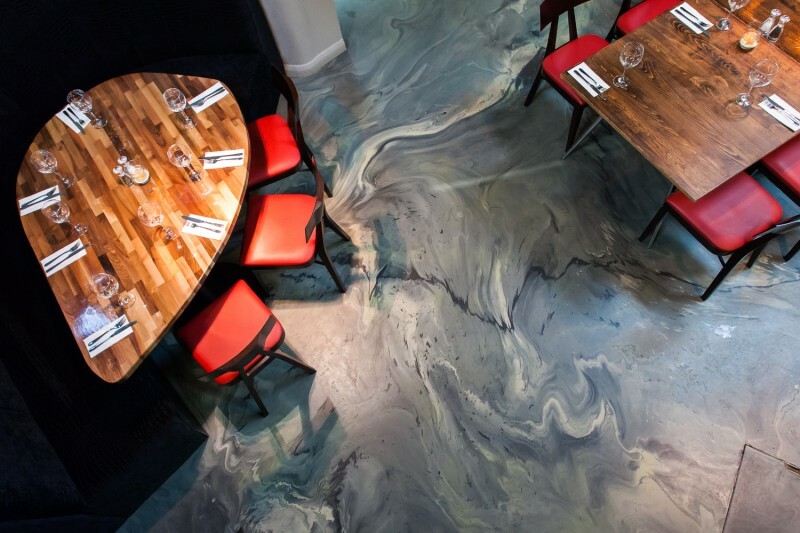 In a similar way, a poured resin floor can be designed in a variety of different colours – and our Motion floors create a blend of two colours with noticeable movement in the floor colour. The next major breakthrough was in the use of stone floors in the more progressive Ancient civilisations – everywhere from Greek marble and Roman mosaics, to the natural stone floors of the pyramids. And one of the innovations we are most indebted to was the Roman development of the first prototypes of under-floor heating. Stone floors were built in the manner of raised access floors, with some empty space below – a fire was lit at one end and a vent at the other drew the hot air across the space, thus heating the stone floors above! This was then developed into the first wet under-floor heating, with series of pipes under the floors through which hot water flowed. These innovations were huge leaps in interior engineering and paved the way for flooring systems thousands of years later. 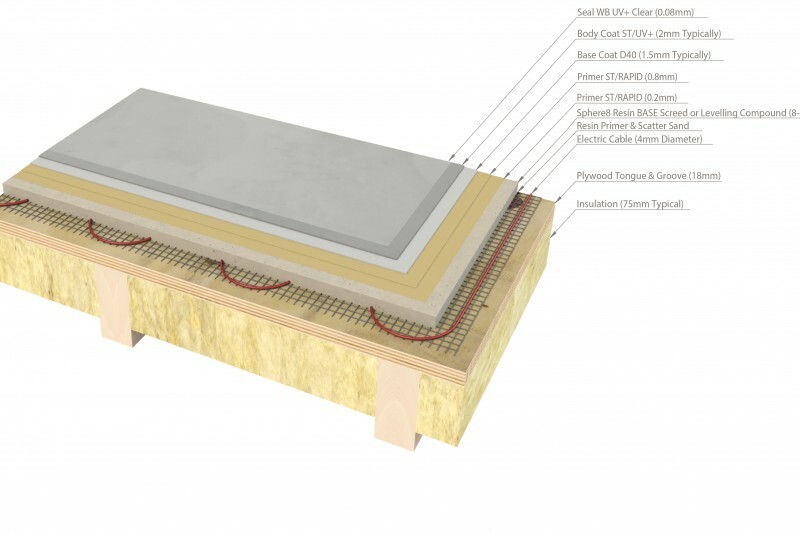 We still work with under-floor heating on a lot of our residential projects – it works perfectly with our natural biopolymer resin, and is still a very popular feature in many homes. These innovations are also significant as they were few and far between – little evolved in terms of flooring for hundreds of years after the fall of the Roman Empire. In many cases flooring returned to the days of compacted earth and waste, strewn with deodorising mint or grasses! Even in Western Medieval royal courts you could expect to find an unhygienic build-up of filthy straw and hay on internal floors! However, the Middle Ages did see the earliest known use of wood floors – originally they were just rough planks laid across the ground surface, and finishes evolved by sanding, smoothing, staining and varnishing the wood. 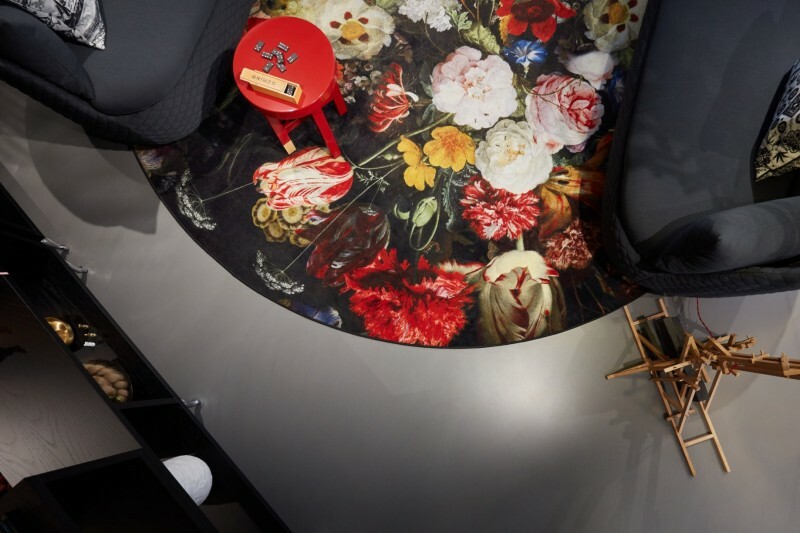 It seems we have an insatiable desire for floor graphics, as very quickly this turned to craftsmen carving and painting patterns and designs on the wood. At the same time, both tiles and carpets have been in use in some form for over 4000 years and have evolved from functional scraps to decorative specially-made floor surfaces in their own right. 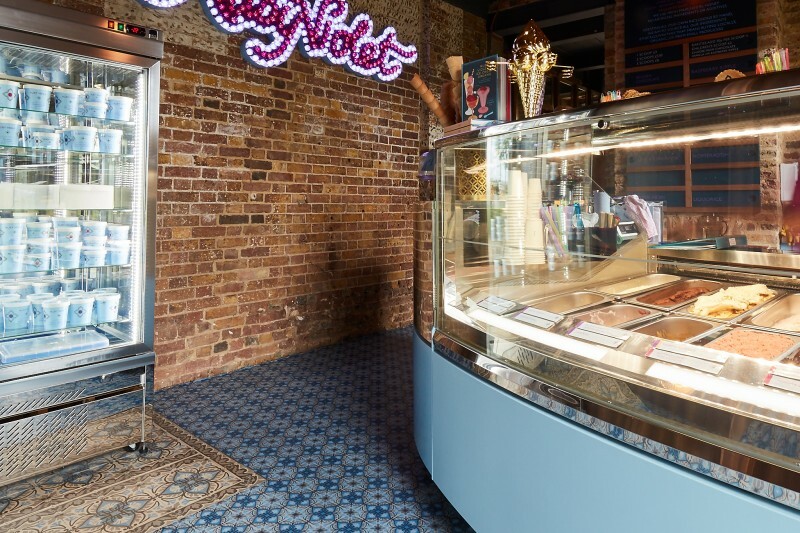 The popularity of tiled flooring has fluctuated over the centuries – from being all the rage in Roman decoration, to disappearing from Western Europe in the Middle Ages. Decorated tile floors continued to evolve and featured prominently in Middle Eastern and Latin design throughout this time, but it was until the mid-1800s that they were popularised again throughout Europe. Similarly, carpeted floors can be traced back as far as 2000 BC in Egypt, the Middle East and Asia – where rug weaving remained popular over the years. Chinese carpetmaking can be found as early as 10th Century, and their artistry has always been greatly admired. In later years (some time around 16th Century) the Persian rug weaving industry expanded in modern-day Iran, and Persian rugs are still a highly desired floor covering. It’s always valuable to consider the events and developments that led to our current achievements. The versatility of ancient Indian sand floor designs and the creation of Roman under-floor heating both contributed to what you can now experience with a Sphere8 floor! It’s also proof that constant innovation is what drives our industry forward. The survival of tiles, stone and wood as popular flooring solutions is testament to their practical and aesthetic strengths, but at Sphere8 we have found ways of incorporating these design features into our relatively modern flooring solution – you can recreate a bespoke tile design with DesignSphere (as this case study shows…); we offer TeakSphere as a way to imitate a wood finish; and our terrazzo system BrecciaSphere actually incorporates a range of stone, glass and marble aggregate into an elastic and durable resin floor! Proof that favourites are favourites for a reason, but innovation will always keep us driving forward – a good sentiment to bear in mind!